Everybody knows about the Norman conquest of England in 1066, of the Battle of Hastings and King Harold getting shot in the eye with an arrow (though this is now being hotly debated). The name William the Conqueror is known to school children and adults alike, and the Bayeux Tapestry is instantly recognizable and famous across the world. But this is not the full story of the Normans. How many people know about the Viking origins of the Normans? How often do we hear about the crusader Normans, and those who ruled Sicily and rescued popes from grasping emperors? How have I not heard about the Norman ruler nicknamed 'the Monkey King'?!?!?!? 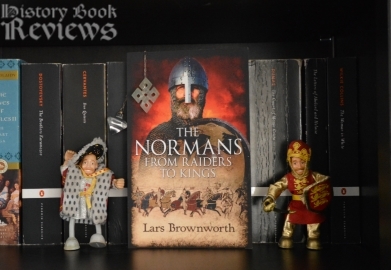 These lesser known figures have always fallen in the large, dark shadow cast by William the Conqueror, but finally step into the light in Lars Brownworth's The Normans. What I loved about this book was the introduction to so many new historical figures and to a deeper understanding of who the Normans were. What I didn't like about it was that it had all the depth of a History Channel documentary. For all the incredible complexity of this period and all the fascinating and bizarre historical figures, this book should have been at least three times as long as it was. At only 200-odd pages, it merely skims over the surface of the historical ocean, barely getting wet along the way. This shallow approach to such an intricate story detracts from the experience of reading it, at least in my opinion. One example of this is how Brownworth calls King Aethelred "Unræd" of England "the Unready", without even mentioning the issues in the translation of this nickname, and its more likely meaning as "the ill-counseled". I suppose it's fair that this book functions more as a simple narrative and introduction to this time period and this group of people, but to me it lacked exploration and analysis, which are such compelling parts of history books. The first part of this book deals mainly with the origins of the Normans, exploring how they transformed from marauding Vikings in the 10th century to civilized ducal landholders in the 11th. The most fascinating figure in this story, and the founding father of Normandy, is Rollo. He was also called Hrolf Ganger, or Rollo the Walker, because supposedly he was so large that the little Viking horses couldn't carry him, so he had to walk everywhere. Presumably he was aware how ridiculous he looked with his feet dragging on the ground and the poor pony sagging under his weight! Rollo was besieging Chartres in France in the early 10th century, and his ticket to victory was his bizarre tactic of slaughtering every horse and cow he could find and building a wall out of their corpses. Faced with this indefensible approach, King Charles the Simple offered the city of Rouen to Rollo if he agreed to convert to Christianity and stop raiding Frankish territory, and the land of the Normans ("North-men") was born. Within a few short generations, Rollo's descendants had won the title of "duke" (basically just by calling themselves that and having no one oppose them), and the duchy had become a powerful force. 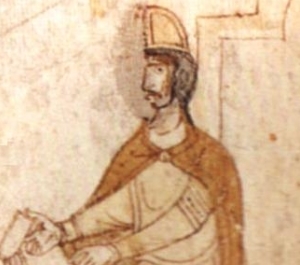 Tancred, King of Sicily from 1189-1194. Derisively called the Monkey King...and it's not hard to see why! After Rollo, the story follows the successive Norman rulers chronologically. The main take-away is that there were a surprising amount of assassinations, kidnappings, rebellions, king-making, and excommunications in this relatively short period. Brownworth briefly discusses all the prominent Normans, forever characterized by history by their one-word nicknames, such as Richard the Fearless (good one! ), Richard the Good (ok, I guess), and Robert the Devil (that's quite unfortunate). He also covers the background for the Norman conquest of England, including the state of the Anglo-Saxon monarchy at the time and all the familiar characters of Godwin, Harold, Tostig, and the gang. The adventures of the Normans in Italy were the highlight of this book for me, mainly because I didn't know much about it before. It all really began with Tancred de Hauteville, a simple knight in the 11th century. Tancred just so happened to have a million kids (ok, not really, but a lot!) and couldn't support any of them, so they moved out to gain their fortunes abroad, mostly in Italy. There was William Iron-Arm, who split a man in half with one blow (sword included); Robert Guiscard, who used to set peoples' crops on fire and then charge money to extinguish the flames; and Roger de Hauteville, who was tormented by tarantulas in Palermo. Understandably, anti-Norman feelings began to grow in Italy. Even the Pope marched on them to get them under control, but those crafty Normans just captured him instead. They turned their attentions to the east, fighting in Byzantium, Sicily, and in the Muslim world during the Crusades. Robert Guiscard even took a solemn vow to remain unwashed and unshaven until he could resume the fight in Byzantium; I'm sure his close friends and family were thrilled. Eventually these adventures led to the crown of Sicily and the Normans ruled there as kings for several generations. This book does a good job showing how complex these times were. The past comes across as nothing so much as one giant chessboard of popes, kings, mercenaries, dukes, armies, crowns, and power. However, there is not enough depth or focus in the book to truly remember and distinguish these personalities and the deeds they performed. Except Tancred the Monkey King, he stands out crystal clear, poor man. Someone actually said "Behold, an ape is crowned" at his coronation! This is so rude---and not least because I have to point out that a monkey and ape are NOT THE SAME THING. Anyway, The Normans does serve as a good introduction and a solid base for further study. The Normans come across as incredible people---violent, power-hungry, bold, crafty, and clever. Sometimes I got the feeling they were just doing all this because they were bored. From Viking marauders to knights, crusaders, and kings; from a landless sea people to rulers of some of the largest realms in the medieval world; the people we see as the Normans only ruled for a few hundred years and were absorbed into other cultures by the end of the 12th century. Brownworth reminds us why they were important; where they came from and what legacies they left behind, and why they still fascinate us today.